Bert Gildart: According to Stephane Poulin of the Arizona Sonora Desert Museum, Arizona is the rattlesnake capitol of the nation. Not surprisingly approximately 300 bites occur in the state each year, but Stephane says that 65 to 70 percent of those bites are avoidable. 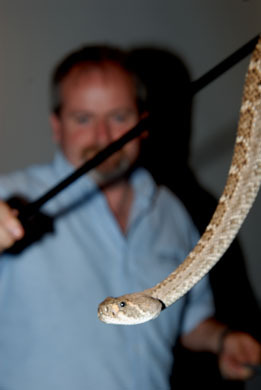 Stephane says that rattlesnake venom works on the blood, inhibits the ability of your blood to clot. It works on you just like it works on something the rattlesnake is trying to eat. The rattlesnake bites its prey, which then runs off. But the venom begins to work and within seconds the prey—something like a chipmunk—is immobilized. Because we’re bigger, the venom doesn’t work as well. Still, the venom can kill and each year an average of one person dies here from a rattlesnake bite, and generally it’s someone who hasn’t sought medical attention after a bite. Stephane continues, saying that there are possibly as many as 50 rattlesnakes throughout the museum’s compound, and that six of them have radio transmitters embedded beneath their skin. 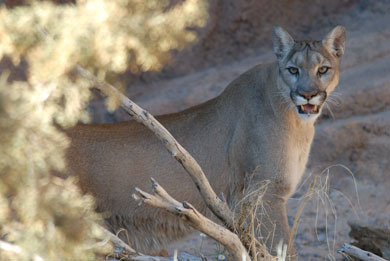 MOUNTAIN LION: The Sonora Desert Museum has acquired an international reputation for interpreting this wonderfully fascinating place. Contained within the compound we found most all of the creatures in the Sonora—in settings that provide beautiful and natural backdrops. We spent the entire day watching such animals as the desert big horn sheep, the mountain lion, and the javelina. Along with each creature, the museum provided much interesting interpretation. For instance, while on their “Desert Trail,” interpretive signs explained techniques used by javelina to avoid the heat. For me, however, the most interesting presentation was the one provided by Stephane on poisonous creatures. Several years ago, I had worked here with a herpetologist for a story on Gila monsters, and once again found the creature just as interesting. 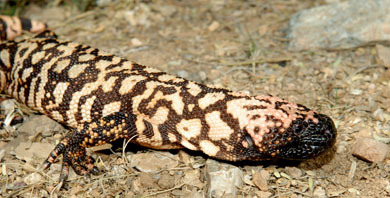 At 24 inches and one-and-a-half pounds, the Gila monster is the nation’s largest lizard. Its blend of yellow and black and occasional tinges of orange and pink, put it among the most colorful. Living up to its name, the Gila monster is also the nation’s only poisonous lizard. The Gila (pronounced Hee-la) monster was first described in scientific journals in the mid-1800s as Heloderma suspectum. The generic name derives from a Greek word that translates as “studded skin.” Curators at this museum, who routinely trim the little-used claws of captives, say the skin does indeed “feel and look beaded.” The appearance results from thousands of tiny bones in the lizard’s skin, which conjures up images of a diminutive creature out of Jurassic Park. GILA MONSTER: The second half of the Gila monster’s scientific name, suspectum, comes from the fact that initially, scientists were suspicious as to whether or not the creature was poisonous. At the time investigators only suspected the animal’s saliva was toxic. Later scientists confirmed that the animal produced poison—and that it was painful. Biting compresses poison glands in the monster’s lower jaw, which releases a neuro-toxin that travels along grooves in the teeth into its victim, creating intense pain, as a professor at the University of Arizona told me. Despite the pain, Gila monster venom seldom produces death, just intense pain, and that knowledge was sufficient to make me mighty wary the other day as I tried to photograph one in an open setting. Just last week a photographer had been bitten. Apparently he wanted the animal oriented differently and when he couldn’t accomplish that by probing with a stick he had grabbed the animal’s tail. The Gila monster whirled and clamped down hard. As Stephane exclaimed, the incident dramatized the way in which most people get bitten by Gila monsters. “Gila monsters,” says Stephane, “have extraordinary life histories,” and that became just another of the fascinating stories we heard throughout the day at the Sonora Desert Museum. This entry was posted on Friday, March 9th, 2007 at 8:09 am and is filed under Natural History/Conservation, Travel. You can follow any responses to this entry through the RSS 2.0 feed. You can leave a response, or trackback from your own site.